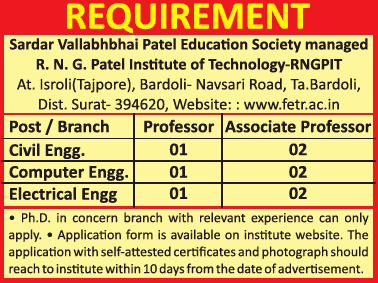 R.N.G.Patel Institute of Technology, Surat has advertised in THE TIMES OF INDIA newspaper for recruitment of Professor / Associate Professor jobs vacancies. Interested and eligible job aspirants are requested to apply within 10 days from 30th January 2019. Check out further more details below. About College: Established in 2010 as a Center for Excellence, R. N. G. Patel Institute of Technology [RNGPIT] is recognized by All India Council for Technical Education (AICTE), New Delhi and Gujarat Technological University (GTU), Ahmadabad.The institute is situated near Isroli-Afwa in Bardoli taluka of Surat District, about 4 KMs away from Bardoli Town. The institute provides students all possible infrastructure and educational facilities such as neat and airy classrooms, tutorial rooms, fully equipped laboratories, language lab to empower them in communicative English, computer center, library, workshop, playground and canteen. How to Apply: Interested and eligible candidates are requested to download prescribed application format from college website and send filled-in application with self attested copies of certificates and recent passport size photo to the postal address provided below.